It is rare in the world of literature to come across a person as important as he is neglected. Rahul Sankrityayan invented the Hindi travelogue. By the time he died, at the age of 70, he had written about 140 books, a Sahitya Akademi winning seminal history, Madhya Asia ka Itihaas, on the history of Central Asia and innumerable commentaries on social and spiritual ideas. 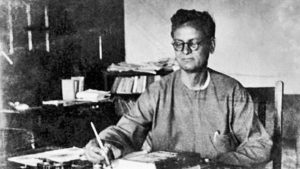 Sankrityayan’s seminal texts remain either un-translated into English, or more tragically, lost. However, an exhibition at the Indira Gandhi National Centre for Arts (IGNCA) on the heels of Sankrityayan’s 125th birth anniversary may prove pivotal in reviving interest in the works of the man. His re-introduction in the public sphere, however, may be determined not by what he created, but what he helped save. “We had a conference about his works earlier and when scholars from around the world showed interest, we thought it would be crucial to have a visual element so we put together an exhibition. People connect to a subject more when there is a visual cue. And if anyone believed in preserving the visual element of history, it was Rahul Sankrityayan,” says Professor Radha Banerjee Sarkar, in charge of East Asia, at IGNCA. A well-travelled man, Sankrityayan was also a keen scholar and collector. Through four trips to Tibet between 1929 and 1938, Sankrityayan salvaged Buddhist scriptures, paintings and artefacts that were later donated to the Patna Museum, from where they have now travelled to Delhi for the first time in nearly 70 years as part of the exhibition. “A large number of Buddhist scriptures and texts were lost in the burning of the Nalanda libraries or with the decline of Buddhism in general. Sankrityayan played a crucial role in saving 700-800 manuscripts from Tibet. His contribution in preserving this slice of invaluable history is incredible,” says Banerjee. He made most of his trips in the pre-automobile era; most of what he assembled or bought was carried either on mules or on foot. Sankrityayan, born Kedar Pandey, on April 9, 1893, grew up in a small village in the Azamgarh district of Uttar Pradesh. Sankrityayan studied only till middle school. He began travelling the length and breadth of the continent from his teens onwards. He also joined the Arya Samaj, then became a Buddhist and travelled to Sri Lanka. His journeys took him as far as Russia and across the Himalayas — from India to Nepal. Wherever he went, Sankrityayan learned the language and studied the local culture, be it Arabic, Russian, German, Pali or Tamil. By the end of his life he could read at least 30 languages and write in at least a dozen. He participated in the Indian independence movement during the 1940s and turned to Marxism in the last leg of his life. The Patna Museum’s collection on display at IGNCA is an endorsement of the study of interconnected faiths and cultures that Sankrityayan championed. “One of his major contributions was to turn the lens on the way faiths and cultures interconnected, to attempt for a holistic view of the continent. We have a habit of studying iconographies and histories in isolation, which is why we fail to see the way Buddhism and Hinduism interacted. Rahul was perhaps the first person to give a complete view of this interactive history, through his texts, the travels and the artefacts he brought back,” Banerjee says. The Thangkas (Tibetan Buddhist paintings on fabric), stunningly crafted on silk are evidence of that. The survival of these paintings and other paraphernalia is near miraculous considering some date several centuries back. « Why Lingayats want separate religion ?